In much the same way as it transformed cruising by offering up-market guests longer stays and more overnights on nearly all of its voyages, Azamara Club Cruises is once again evolving its Land Discoveries shore excursion program with two new offerings aimed at culture-seekers. Beginning with the 2014 Europe season, guests searching out a more in depth, personalized destination experience can choose from two exclusive programs that will immerse them in a destination through its people. The first program, Insider Access, features exclusive invitation into the ancestral home, workshop or place of business of a local insider. It allows guests to actively engage with knowledgeable individuals who will share colorful stories and historic tales of their home destination on a personal level. The second, Nights and Cool Places, makes the most of Azamara’s longer stays in port and overnights with an intimate night touring program. These custom after dinner experiences give guests exclusive opportunities to visit world-famous museums after hours, such as Malaga’s Picasso Museum; sip cocktails at a local hot spot, such as Rio de Janeiro’s Scenarium; or take a stroll on an intimate guided architectural walk – all with a local guide. Through these new Land Discoveries programs, Azamara is curating these sought-after collectible moments for its guests. For example, as part of the new Insider Access program, guests calling at Haifa, Israel, can step into the home of a Druze family for a hands-on cooking workshop. While the meal is being prepared guests will get insight to the secret religion, tradition and culture of the Druze people who have inhabited the holy for hundreds of years. Both of these new programs continue to build on Azamara’s promise of destination immersion to its guests. The Insider Access program creates an intimate group of eight to 12 curious and adventurous guests and provides them with access to the people of a destination, while the Nights and Cool Places program will offer 15-20 guests exclusive access to some of the world’s best known sights. For example guests sailing an Asia itinerary can sign up for a night tour to view Hong Kong’s famous Symphony of Lights from the Sky Terrace at the Peak following a tram ride offering incredible panoramic views. The Insider Access and Nights and Cool Places programs will be available for booking beginning late March. For a full list of Land Discoveries shore excursions visit http://www.azamaraclubcruises.com/landdiscoveries. Azamara Club Cruises offers distinct destination-immersive experiences for up-market travelers. The cruise line features voyages with longer stays and more overnights at ports to provide guests the opportunity to experience night touring at some of the most compelling destinations of Europe, Asia, South America, West Indies, as well as Central and North America. On board the intimate Azamara Journey and Azamara Quest, guests receive exceptional and personal service and the cruise line’s authentic, exclusive and bespoke AzAmazing Evenings events that showcase the unexpected colors and flavors of a destination. Guests also enjoy fine cuisine and boutique wines from around the world, as well as more inclusive amenities, such as included gratuities; complimentary bottled water, sodas, specialty coffee, and teas, as well as complimentary boutique wines, international beers and select standard spirits in the ships’ bars, lounges and restaurants when open; complimentary self-service laundry; English Butler service for suite guests; and shuttle transportation to city centers in ports, where available. 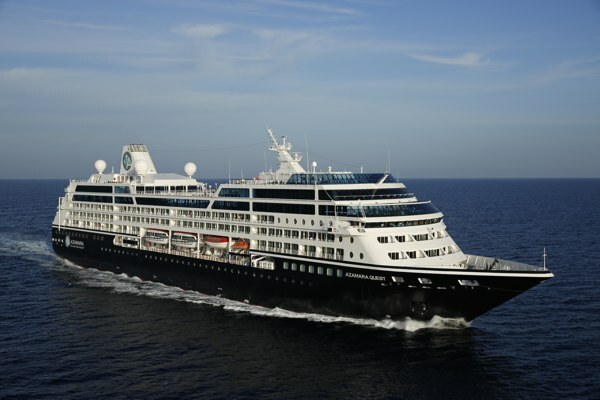 For more information, call your travel professional, dial 1-877-999-9553, or visit http://www.AzamaraClubCruises.com. Connect with Azamara Club Cruises on Facebook at http://www.facebook.com/AzamaraClubCruises, on Twitter @AzamaraVoyages or follow President and CEO @LarryPimentel.